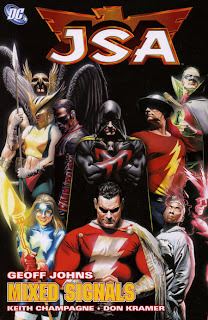 Geoff Johns delivers again with JSA: Mixed Signals. It's a shame, almost, that so much happens so well in JSA; in a way I feel as if I'm fighting event fatigue -- first the JSA travels to the past and teams up with the original JSA, and then the JSA returns to Kahndaq and has to fight the Spectre, Eclipso, and Black Adam, and then Donna Troy arrives, and then Mordru escapes, and then and on and on. Which would certainly be more of a problem if the overall stories and art weren't just so good. The trade gets off to an eccentric start -- first there's an obligatory, and fairly generic, attack by an OMAC; when Donna Troy arrives on the scene, the story derails almost completely, following Alan Scott, Hal Jordan, and Air Wave to New Chronus (with barely a JSA member in sight), though Johns does get points for a nice Alan Scott/Hal Jordan scene that touches on the themes of the new Green Lantern series. After that, however, comes another wonderfully rollicking Johns-ian JSA story, as half the team faces off against Mordru over the fate of, well, Dr. Fate, and the other half travel to the Fifth Dimension to save Jakeem Thunder and the Thunderbolt from a mystery enemy (the revelation of which again shows Johns's comics continuity mastery). There's also a nicely-done one-shot focusing on Stargirl which begins to delve into Infinite Crisis, and also (I think) sets the stage for the upcoming Justice Society of America series. JSA artist Don Kramer writes some issues here, and he has the rhythm of the characters down well enough that it's hard to tell what's Kramer's and what's Johns'. A high-quality JSA trade, on par with the rest.